In many applications, separable algorithms have demonstrated their efficiency to perform high performance and parallel volumetric computations, such as distance transformation or medial axis extraction. In the literature, several authors have discussed about conditions on the metric to be considered in a separable approach. 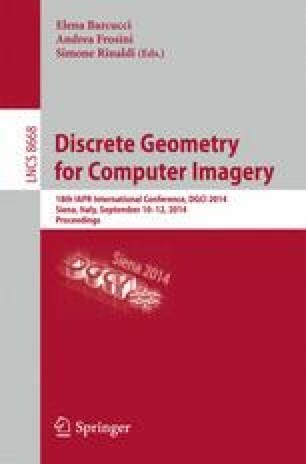 In this article, we present generic separable algorithms to efficiently compute Voronoi maps and distance transformations for a large class of metrics. Focusing on path based norms (chamfer masks, neighborhood sequences, ...), we detail a subquadratic algorithm to compute such volumetric transformation in dimension 2. More precisely, we describe a O(log2 m·N 2) algorithm for shapes in a N×N domain with chamfer norm of size m.
This work has been mainly funded by ANR-11-BS02-009 and ANR-11-IDEX-0007-02 PALSE/2013/21 research grants.